Calendula is a genus of about 15 to 20 species of annual and perennial herbaceous plants in the daisy family Asteraceae that are often known as Marigolds. They are native to southwestern Asia, western Europe, Macaronesia and the Mediterranean. Calendulas have been used traditionally as culinary and medicinal herbs. The most commonly cultivated and used member of the genus is the Pot Marigold (Calendula officinalis). Popular herbal and cosmetic products named “Calendula” invariably derive from C. officinalis. The Calendula flower has long been a staple in British cottage gardens. When used in stews, broths and salads, petals of the flower add a spicy taste similar to saffron to many dishes. All parts of the plants are useful in many ways. The plant is said to stimulate the immune system and is currently used as an ingredient in many cosmetics. Flowers and leaves may be dried and stored for later use. In the vegetable garden, Calendula draws aphids away from valuable plants. Romans and Greeks used the golden Calendula in many rituals and ceremonies, sometimes wearing crowns or garlands made from the flowers. One of its nicknames is “Mary’s Gold,” referring to the flowers’ use in early Catholic events in some countries. Flowers are sacred flowers in India and have been used to decorate the statues of Hindu deities since early times. While uses of Calendula plants are diverse, growing it in the flower or herb garden is an optimum use of this attractive plant. Plants are frost tolerant and somewhat cold hardy and add long-lasting color and beauty in a flower bed or container. The Calendula flower or flowering herb is an annual which will readily reseed. Too much care can result in stunted or slow growth of the plants. Poor to average, well draining soil and only occasional watering after plants are established is the secret to growing prolific Calendula plants. Like most herbs, Calendulas are adaptable and do not require a lot of maintenance. Roots will often adapt to the space provided. The amazing Pot Marigold can be grown in containers or beds in full sun to shade conditions. 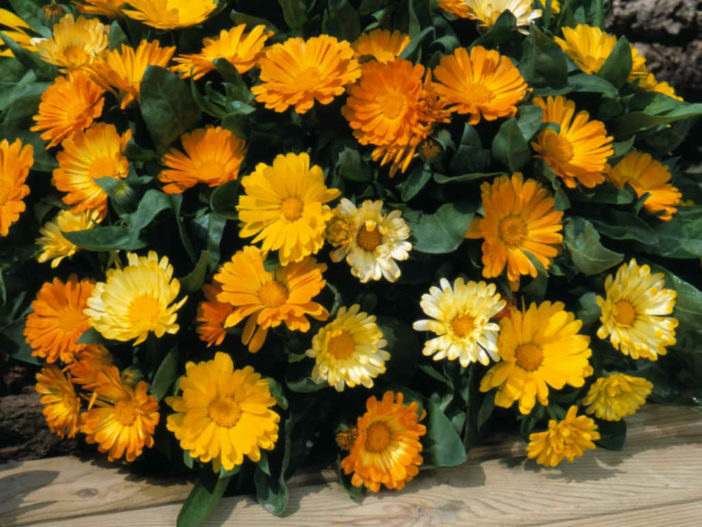 As the Calendulas prefer cool temperatures, flowers last longer in filtered sun or shady areas. If deadheaded regularly, this plant can bloom from spring through fall and beyond. In warmer areas, the Calendula may take a break from blooming during summer heat and then put on a show as temperatures fall in autumn. Regular pinching keeps the 1- to 3-foot (30 to 90 cm) plant bushy and prevents tall, spindly stalks. Now that you’ve learned how to grow Calendulas, take advantage of their long-lasting blooms in the herb garden or light shade area. Experiment with use of Calendula flower petals to replace saffron in recipes. If you are so inclined, use plant parts as a topical treatment for minor scrapes and cuts.